I often wished for an easy to use app that would assist me when deciding what Enriched Air Nitrox (EAN) mix to fill my cylinder with for a Nitrox dive. 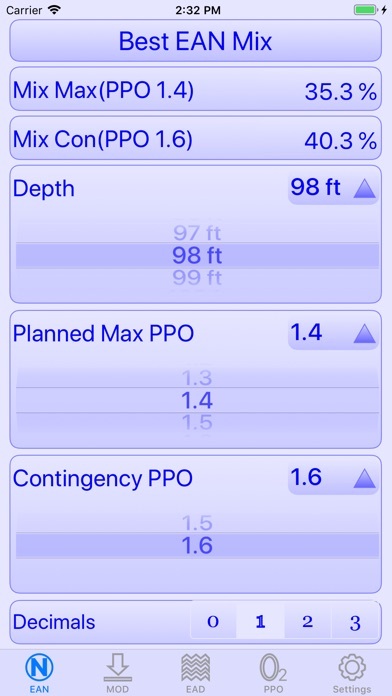 When my friends, my dive buddy and myself could not find an app that did what we needed I created the Nitrox Helper app. Nitrox Helper has become our dive buddy assisting us at the dive shop. 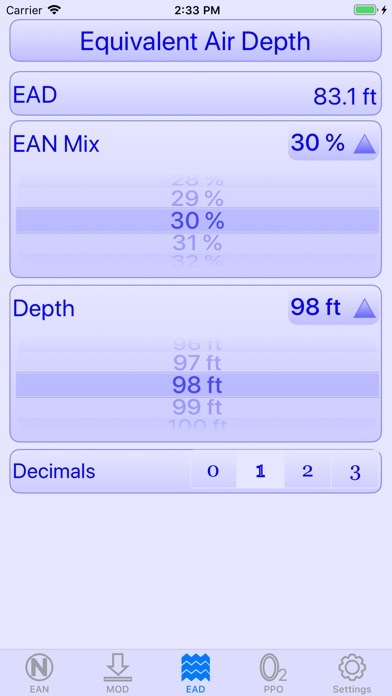 Nitrox helper is a Nitrox calculator created for use by qualified Enriched Air Nitrox (EAN) divers. Nitrox Helper is designed to be easy to use Nitrox calculator and the screens are designed to be easy to read and use even with cold hands. Nitrox helper can be customized to use feet (imperial and U.S. customary measurement system) or meters (metric system). The color scheme of Nitrox Helper can be changed by selecting a color from the available list of themes. The calculations for using Nitrox allow the user to select the planned oxygen partial pressure for the dive as well as the contingency oxygen partial pressure. Both the planned and the contingency oxygen partial pressure can be set by the user. All the calculations allow the user to set the number of decimals to display for the Nitrox calculation. This allows for increased bottom time when using a dive computer that permits the use of decimal inputs. 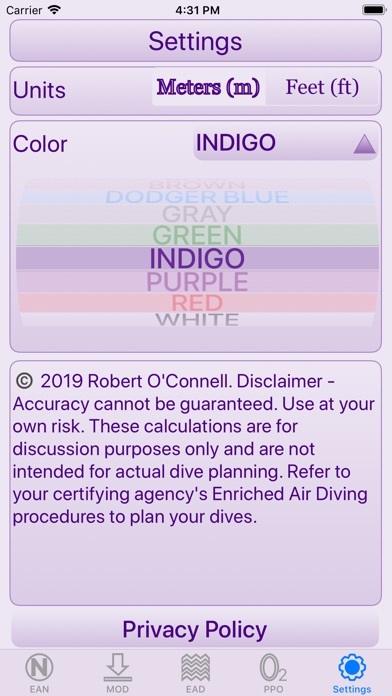 Always refer to your certifying agency's Enriched Air Diving Nitrox procedures to plan your Nitrox dives. The Nitrox Helper app does not have in-app advertising. The Nitrox Helper app does not have in-app purchases. Nitrox Helper does the following calculations for Nitrox divers: Best Mix The best mix view calculates the best EAN Nitrox mix for a specific depth and specific oxygen partial pressure. Maximum Operating Depth (MOD) This view helps the user to calculate the maximum operating depth for a specific EAN Nitrox mix and specific oxygen partial pressure. Equivalent Air Depth (EAD) This view helps the user to calculate the equivalent air depth for a specific EAN Nitrox mix and a specific depth. 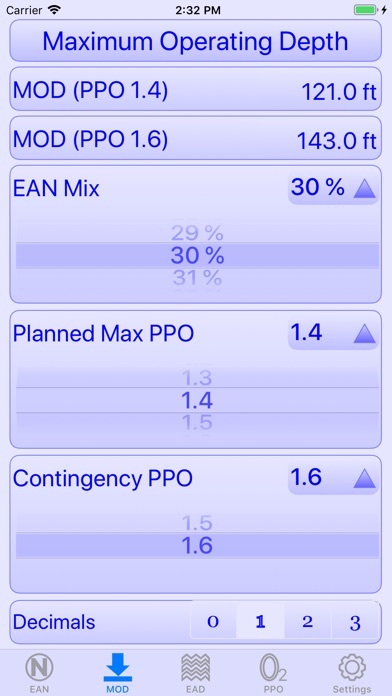 The EAD allows a diver to use the normal air Recreational Dive Planner (RDP) table for virtually any enriched air Nitrox blend. Oxygen Partial Pressure (PPO) This view calculates the oxygen partial pressure for a specific EAN Nitrox mix and a specific depth. 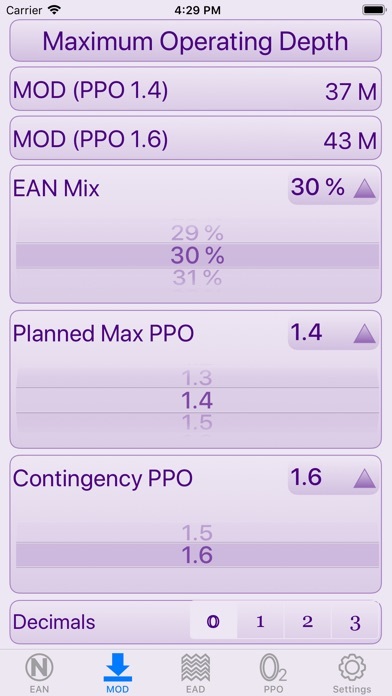 PPO results greater than 1.6 are highlighted and displayed with a warning. The oxygen partial pressure is required to track oxygen exposure using the DSAT Oxygen Exposure Table for Enriched Air (Nitrox). FAQS On what IOS devices will Nitrox Helper run? 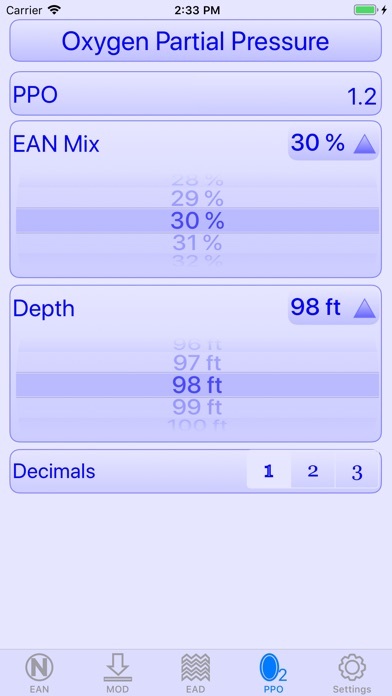 Nitrox helper is compatible with the iPhone and the iPad. On what versions of IOS will Nitrox Helper run? Nitrox helper requires IOS version 11.1 or later to run. Where can I download Nitrox Helper? This app is only available on the App Store for IOS devices. Does the Nitrox Helper app have in-app advertising? No. Does the Nitrox Helper app have in-app purchases? No. Disclaimer The Application is only intended for use by qualified Enriched Air Nitrox (EAN) divers. Accuracy cannot be guaranteed. Use at your own risk. These calculations are for discussion purposes only and are not intended for actual dive planning. 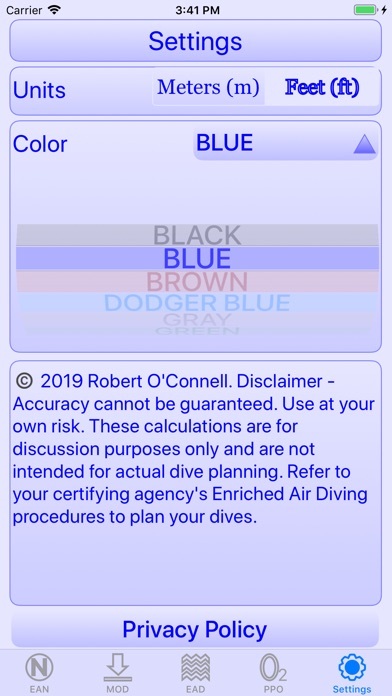 Refer to your certifying agency's Enriched Air Diving procedures to plan your dives.